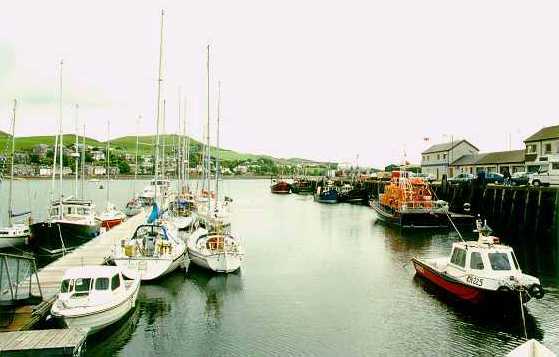 Sea front Campbeltown, the largest town in the peninsula of Kintyre and third largest in Argyll lies some 140 miles by road from the nearest large town, Glasgow, but only 14 miles across the Irish Sea from Northern Ireland. With a population of around 5,500 people (and falling) it is often aptly described as the most southerly point of the Highlands, indeed it is more southerly than Berwick in England! You can get to this beautiful part of the world by bus, plane, or car although the nearest train station is almost 100 miles away in Oban! There are two flights per day to and from Glasgow operated by flybe which take approximately 25 minutes flight time. Alternatively you can get the bus from Buchanan Street Station in Glasgow, and although a lot cheaper than the plane, it takes between 3 and 4 hours! (But you do get a chance to admire the scenery on the way down). It is operated by the local company West Coast Motors who I used to occasionally drive for. Citylink provide a journey planner here. 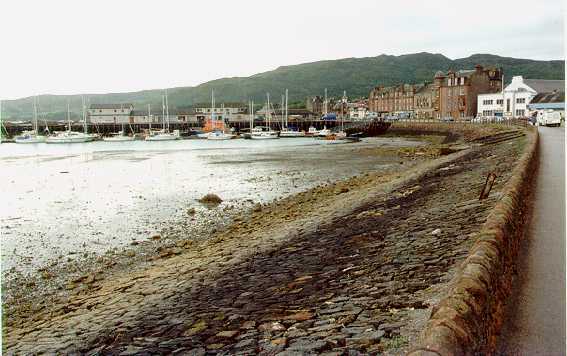 As the traditional sources of employment continue to decline, Campbeltown in line with most of the more remote areas of Scotland has become more and more dependent on tourism. There are a number of golf courses in the area, the most famous being Machrihanish Golf Club, which has recently been joined by the newly built Machrihanish Dunes club. There's also Dunaverty, another 18 hole course in nearby Southend, and small 9 hole courses in Carradale and Tarbert. There's a swimming pool, a cinema and all the usual trappings such as pony trekking etc. If you're on a yachting holiday you can tie up to the pontoon shown in the picture on the left. There has in the past been a ferry service between Ballycastle and Northern Ireland although it is unlikely to run again until .... goodness knows when. Check out the ferry news page for the current state of play. Originally the main industries in the area were farming, fishing and the distillation of whisky. Once the capital of whisky production in Scotland, more recently there was only one distillery left producing - the world renowned Springbank. In recent years however Glen Scotia has reopened and the Glengyle distillery has started producing under the same ownership as Springbank. 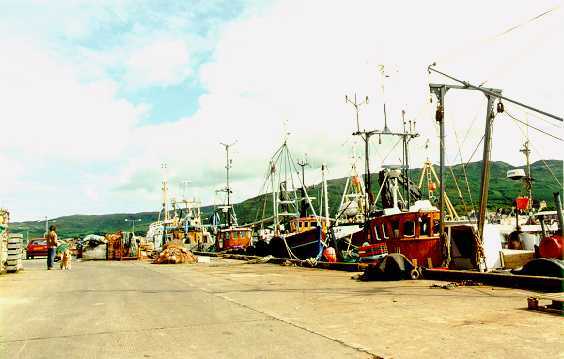 The fishing fleet is down to a shadow of its former self, although agriculture is still a fairly major contributor to the local economy. Campbeltown Shipyard, after lying dormant for many years has now been pulled down. It used to be well known for its steel hulled fishing boats. Danish company, Vestas, built a wind turbine manufacturing facility at Machrihanish which brought much needed employment in the area, however it pulled out, the facility then being taken over by Skykon in 2009. Update 26/10/10 - Skykon announce "in cash strapped situation". Up until a couple of years ago there was a Jaeger Menswear factory and a factory producing model aircraft called KV Wooster International - unfortunately they're both now gone. The picture shown on the left was taken from a postcard dated 1914, so it must have been taken some time prior to this. It shows Longrow from the Main Street end. The large building on the right is Mafeking Place which looks pretty much today as it did then. In fact with the wonders of Google StreetView you can see how that same view looks now. 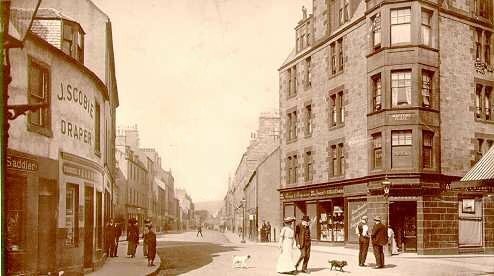 The shop on the nearest corner of Mafeking Place which used to house the local Co-op supermarket, lay empty for a number of years as the creation of two modern supermarkets further up Longrow removed a lot of the smaller traders and took the heart out of the traditional town centre.